Somalia Al-Shabab's Resurgence: FILE - In this Wednesday, Feb. 29, 2012 file photo, Ethiopian military tanks sit in position on the outskirts of the town of Baidoa in Somalia. 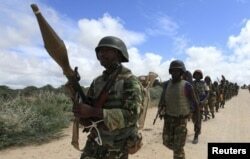 Ethiopian troops who have been fighting Al-Shabab militants in Somalia have vacated a series of military bases, sparking fears of a militant resurgence and a possible setback for African Union efforts to stabilize the country. On Wednesday, Ethiopian troops vacated their posts in Tiyeglow which was seized from Al-Shabab in August 2014. It was the third town the Ethiopian National Defense Forces (ENDF) vacated this month after El-Ali on October 11 and Halgan on October 23. Experts have linked the withdrawals to the frequent anti-government protests in Ethiopia and the recent declaration of the state of emergency, but Ethiopian officials dismissed the connection. Communications Minister Getachew Reda told journalists in Addis Ababa that the troop withdrawals have “nothing to do” with the state of emergency. He said the troops were in Somalia to assist the African Union mission there but were not part of the mission, AMISOM. He said keeping the troops there is posing an “economic burden and logistical challenges” to his government. Reda said the withdrawn troops have not yet returned to Ethiopia. But military sources tell VOA that the troops are being gathered in the towns of Beledweyne and Huddur, in western Somalia, before they start crossing the border into Ethiopia. The troop withdrawal comes at a vulnerable time, as the government is organizing elections throughout November and AMISOM is on the defensive following a string of high profile Al-Shabab raids on key military bases, including an attack on El-Adde earlier this year. AMISOM spokesman Joseph Kibet Murrey told VOA that the troops have left a “vacuum." “That will now force AMISOM to rethink on how we are going to take back those positions and keep those positions. Definitely it will affect our operations, and our planning,” he said. Murrey said the ENDF forces pulling out were deployed in Somalia through a “bilateral agreement” between the government of Somalia and Ethiopia. In Somalia, Defense Minister General Abdulkadir Ali Dini told VOA it’s time the Somali government works towards self-reliance. “Defending the country is the job of every Somali. If you don’t build your national army the anti-peace elements will continue to cause problems,” he said. Asked if Ethiopia informed his government about the withdrawal, General Dini said countries have the right to make their decisions based on their “interests” and “without interference” from another country. “This is how Ethiopia sees its interest; they know what is best for their interest,” he said. 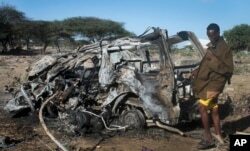 FILE - A Somali soldier stands near a vehicle destroyed by a suicide car bomb attack near the Elasha Biyaha settlement south of Mogadishu, Somalia — an attack that followed the killing of al-Shabab's top leader in a U.S. airstrike, Sept. 8, 2014. The withdrawal also revived the nagging question of when the Somali government will build an army capable of protecting civilians. As Ethiopian troops moved out, Al-Shabab moved in and targeted people suspected of working with foreign troops. In Tiyeglow town for instance, Al-Shabab militants arrested two men, a father and son, and executed them for “collaborating” with the Ethiopians. In El-Ali town, four men were similarly executed by Al-Shabab including a clan elder and a shop owner after they were accused by the militants of “spying” for the foreign troops. It was the same case in Adan Yabal town in May when four elders were also shot dead by the militias on similar charges. These killings and the disorganized nature of the Ethiopian withdrawals from the towns have angered many ordinary Somalis and is destroying confidence in the AU mission, according to officials, some of whom expressed their discontent privately. Hassan Barre Makaran, chairman of Moqokori, which was vacated by Ethiopian troops on September 15, said the troops did not tell him that they were leaving. “It was not something that we were aware of. We only found out when they were leaving,” he said. "I asked – why didn’t you tell us, things will go wrong, can you wait until we get a replacement force? They said, ‘We have orders.'" The chairman of El-Ali made a similar statement, saying he only learned of the withdrawal when he saw the troops pulling down their tents. In addition to the troops currently being withrdrawan, another 4,400 Ethiopian troops were merged into AMISOM in January 2014. Uganda, Kenya, Djibouti and Burundi are the other troop contributing countries. Dini said the Somali government is grateful for the sacrifice made by those countries that sent their troops the country to help Somalia. General Dini said he feels for the victims of Al-Shabab.